By now you should be aware that the landscape of social media is ever-changing, ever-evolving, and rapidly transforming into new avenues for businesses to grow. Facebook in and of itself has seen such massive growth and changes to its platform, particularly in how businesses are utilizing it. Facebook’s growth seems endless. As mentioned prior, Facebook is changing pretty much every single day. From algorithm updates, new offerings, and new product acquisitions (Ex: Instagram and WhatsApp), it’s an exciting time for marketers using the platform to test its limits and grow their businesses. But, there has been one continuing problem recently: decline in organic reach. 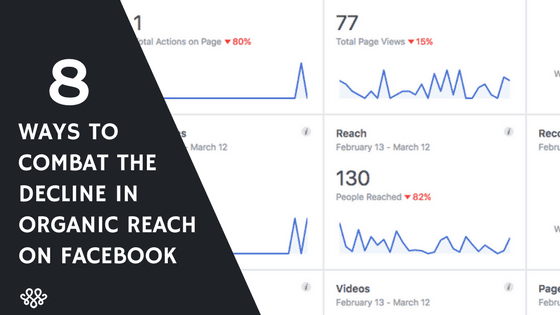 So what exactly is organic reach on Facebook? Organic reach is the number of people who see your content without paid distribution. It includes people who are shown your posts as well as your Facebook page. It’s likely no surprise to most Facebook Page managers that organic reach on Facebook has been in decline since late 2013, according to various reports, with continual changes to the news feed algorithm and re-aligning the priority of what users see. There’s also more content being published than there is news feed space for it to be shown – more than 30 billion pieces of content published every month on Facebook, in fact…and this poses a problem for brands. The latest updates made by Facebook are prioritizing feeds with what friends and family share, more local news, and ensuring the news you see is indeed from trusted sources #nofakenews. This will all conclusively reduce the amount of content that users see from brands and publishers specifically. Facebook has been taking steps in this direction for some time by making tweaks to amplify users’ content while weeding out spam and clickbait. BuzzSumo analyzed more than 880 million Facebook posts from publisher and brand pages over 2017 and noted a clear decline in engagements since early on in that year. Publishers who have been briefed by Facebook believe that this move would cause a more dramatic decline in publishers’ ability to reach audiences in the news feed. This also raises the concern of shifting Facebook strategies to completely paid content. Yes, as a business or brand this means your beloved social media content strategy isn’t reaching as many people as before. What do you do without deviating to an entirely paid social strategy? 1. Keep up with Facebook’s algorithm modifications. You can find them here, on Facebook’s own News Feed FYI. Facebook posts in your news feed will rank with friends and family first, information second, and entertainment third, it will also be influenced by how users behave and interact with certain content. Considering how user behavior is always changing, we recommend keeping up-to-date with how the platform ranks content. 2. Invest in more content marketing campaigns and initiatives in 2018. Increasing your brand awareness, positive standing in the community, and interaction with current and potential consumers revolves around joining in on the conversations already happening. For tips and tricks on implementing content marketing into your strategy, send us a quick note. We’ll chat about it. 3. Plan your posts at peak times. Yes, there are always “recommended” times of when to post, but the best way to optimize is to check your Facebook Manager Insights each week for when post peak times are the highest. It’s also important to begin to understand user behavior across the board and especially in your industry. This will ensure posting at optimal times for the most engagement. Did you know visual content is 40x more likely to be shared on social media than any other types of content? It’s true. And by visual we mean graphics, infographics, video, or animation! If you’re concerned about declines in your Facebook reach, then video is where you should ultimately be looking. Of course, video posts are also seeing declines in organic reach in line with the overall shift, but they’re consistently outperforming all other content types, and are likely to be your best bet in maximizing your reach on the platform. Plan and make your social strategy, make sure you have time to come up with new ideas, not just conforming to the everyday routine. Think outside the box, create an aesthetic, do something someone hasn’t done yet, be original. These are all key points to getting more traction to your social posts. Lastly, make sure to follow through with your strategy – don’t just let all your hard work and thoughts fall through the cracks. 6. Don’t ignore social media. It doesn’t matter how “traditional” you think your business is. The fact of the matter remains: social media will continue to dominate marketing tactics in nearly every industry out there. If you don’t do it first, your competitor will. 7. Cross-promote your other social media platforms with Facebook. The saying “pay to play” is in fact true. You should increase your budget for paid promotions. No, don’t adjust your strategy to entirely paid and don’t always rely on paid content for the best results, but yes, do make sure to test out the waters. Be picky with the content you “boost”, how often, and always make sure to monitor the insights. Remember to keep up with the constant Facebook algorithm changes – in the future they may just benefit you as a brand, so keep an eye out. Make sure to stay relevant (hint: the tips above) and that’s just why we’re here! MAKE Digital Group can cater to all of your creative needs whether that’s for graphic design, video, animation, social and content marketing, or campaign management! We’re your secret superpower to help you get it done. Take a look at our service offerings and get in contact with us today!